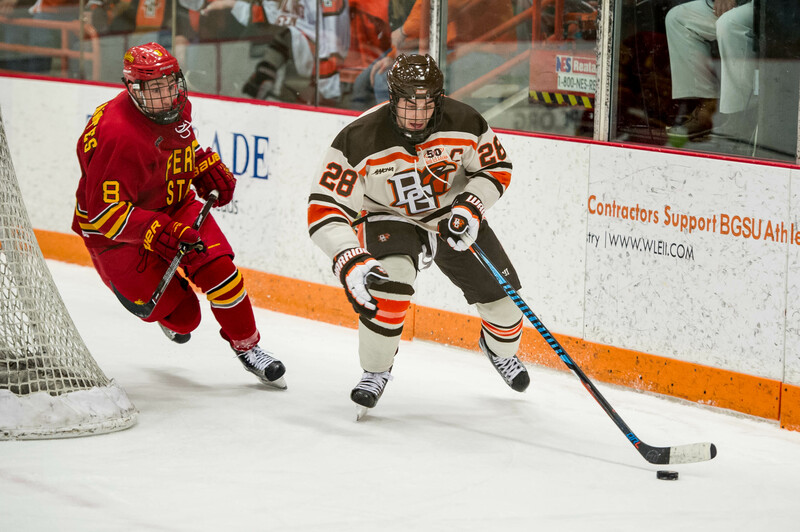 Bowling Green's Sean Walker (right) controls the puck against Ferris State's Andrew Dorantes during Saturday's game (Photo by Todd Pavlack/BGSUHockey.com). Bowling Green had to come from behind to win a game it was in full control of Saturday night in the Slater Family Ice Arena. The Falcons scored three power-play goals in the final three minutes to earn a wild and thrilling 5-3 win over Ferris State. The victory gave the Falcons a sweep of the Western Collegiate Hockey Association best-of-3 quarterfinal series following Friday’s 6-1 win. The Falcons, who finished fourth in the WCHA, will visit top-seeded Bemidji State (21-13-3) or third-seeded Minnesota State (21-11-4) in a best-of-3 semifinal series next weekend. BG, which has won five straight games, improved to 19-17-2 overall. Ferris finished 13-19-5 after being fifth in the league during the regular-season, two points behind the Falcons. The Falcons’ Kevin Dufour tied the game 3-3 with 2:48 remaining, and Alec Rauhauser gave the Falcons the lead only 36 seconds later. Tyler Spezia added an empty-net goal for a 5-3 lead with 33.2 seconds left. Ferris had scored three straight goals to erase a 2-0 deficit, including Trevor Recktenwald’s go-ahead goal with 7:36 left. The Bulldogs tied the game on goals by Mitch Maloney at 11:48 of the second period and Jason Tackett, just 64 seconds before Recktenwald scored. Recktenwald also was called for cross-checking with 2:04 left. The Bulldogs later pulled goalie Darren Smith for the extra attacker to get back to 5-on-5, but Spezia’s goal clinched the victory. BG rallied after Ferris’ Gerald Mayhew received a five-minute major and game-misconduct penalties for checking from behind with 6:40 remaining. Dufour scored on a rebound from the top side of the crease, and Rauhauser scored from inside the left circle. The two power-play goals scored during the penalty to Mayhew came after BG generated few shots during the first 3½ minutes of the advantage, despite the Falcons having significant time in the offensive zone. BUILDING THE LEAD: The Falcons played well to earn their 2-0 lead. The goals came from Joe McKeown at 3:39 of the first period and Mercier at 1:32 of the second period. BG held the lead going into third period, with the help of quality goaltending from Chis Nell. The Bulldogs carried the play during the second period, but Nell limited them to just the one goal. Ferris finished the game with a 30-29 edge in shots on goal. Saturday’s game was much more even than Friday when the Falcons dominated the first 40 minutes. Nell finished Game 2 with 27 saves, including 10 in the first period and nine in the second period. He had four point-blank stops during the final six minutes of the first period, one coming on a breakaway. REVIEW: Recktenwald’s goal that gave Ferris a 3-2 lead was allowed to stand after a video review of approximately seven minutes to determine if he tipped the puck in with a high stick. The lengthy review neutralized Ferris’ momentum after the Bulldogs had scored twice in 64 seconds. “The delay kind of helped because it slowed things down,” Rauhauser said. Dufour then tied the game only 4:48 after Ferris took the lead. Mercier assisted on the goals by Dufour and Rauhauser, while McLain assisted on the Dufour goal and Sean Walker assisted on the Rauhauser goal. Matt Pohlkamp and Mark Friedman assisted on Spezia’s goal. Mercier, Dufour, Pohlkamp and Walker are seniors, and McLain, Spezia and Friedman are juniors. LOSING CONTROL: Although Ferris played well, the Falcons helped the Bulldogs rally. A BG turnover led to Ferris’ first goal, and the Falcons took three straight penalties in the first 11 minutes of the third period. Ferris didn’t have a power-play attempt until the third period and finished the game 1 of 3 with the extra man. BG had all four of the game’s power plays during the first two periods. SUSPENDED: The Falcons played the game without Stephen Baylis. The sophomore forward was sitting out an automatic one-game NCAA suspension after he received his third game-misconduct penalty of the season during Friday’s game. Baylis is one of BG’s best forwards. FINALLY: McKeown’s goal was his first of the season in 18 games and the third in 28 career games for the sophomore forward. His first Falcon points, one goal and one assist, came Jan. 21 last season at home against Alaska-Anchorage. His other goal last season came Feb. 20 at Alaska (Fairbanks). KEY LOSS: The game-misconduct penalty to Mayhew was especially painful for Ferris because he’s one of the team’s best penalty-killers and one of the leading candidates for WCHA player of the year. The senior forward finished the season with 17 goals and 18 assists. His 35 points are second-most in the league. BALANCED SCORING: Matt Pohlkamp finished the series with two goals and four assists, while Mercier and Walker both had a goal and three assists, and Spezia had a goal and two assists. Thirteen Falcons had at least one point in the series, including nine different goal-scorers. CONSISTENCY: The Falcons have won seven straight first-round playoff series —four in the WCHA and three in the now-defunct Central Collegiate Hockey Association series.